Do you want to make your Blogger template SEO friendly but don’t know how the whole thing works? Optimize a blogger template with proper SEO is extremely crucial because it indicates how well your site is being crawled. On the other hand, Search Engine Optimization doesn’t possess the same significance that it uses to have in the past because now Google’s main priority is quality content. Still, optimizing templates with correct technique will not harm you instead your visitors will enjoy the fruitful changes that you have done in your template. Most of the blogspot users think’s that SEO stands for the number of backlinks but deeply it means how well a certain page is organized with proper attributions i.e. H2 Tags, Permalinks, and etc. If you are trying to make your existing Blogger Template Search engine Friendly, then you have arrived to the correct destination. Today we will discuss how we can optimize our Blogspot Template for Search engines. Most of the Blogger Templates are designed by unknown designers so it is quite clear that it lacked a lot in SEO. If you have ever edited a Template, then you might have noticed that most of the templates don’t have Meta tags. Though, Meta tags and keywords can be changed with New Search Preference tool but doing things manually has greater significance so, first we have to optimize our Blogger Template with Meta tags. Replace Your_Site_Description_Here with your site description but make sure it shouldn't exceed 60 characters. Also replace Your_Site_Keywords_Here with 10 to 15 keywords that relates your site niche. After adding the above Chunk of codes, you have successfully enhanced your SEO. Now when crawlers will crawl your home page they will be able to learn much more about your site because through Meta descriptions and keywords tags, you are giving them brief introduction of your site. H2 tags are of greater significance because these little tags allows search crawler to identify which keyword to rank higher in the Search results. If you have ever noticed that the Tags which are associated with Blogger post titles are mostly H3 tags which certainly drop the worth of a certain keyword so, it is extremely crucial that we utilize H2 Tags in our Blogger Post Titles. To change your existing post title H3 Tags To H2 do as follows. Don't forgot to Check/Tick Expand The Widget Box. Now search for the following or similar codes in your template. When you find the above code or a similar one replace it with the following code. Now your H3 Post titles are changes to H2 tags. You have wait around a week till the crawlers update their history, and soon after it you will notice a breeze of traffic flowing all round your site. Remember: Only update your H3 tags if you are not getting sufficient traffic from search engines. If you Blogger template is not optimized for Proper Post Titles then you might have noticed most of your Posts first shows (YOUR_BLOG_NAME), then it shows (YOUR_POST_NAME) which indicates that your targeted keywords is showing at the end, instead of appearing up front. For Example, on a blog we published a post with Name “This Article is Written By Syed Faizan” and your blog title is “My Blogger Lab” then it would appear like this in the Google Search engine “My Blogger Lab : This Post is Written By Syed Faizan”. So, it is crucial that you move your Blog Title in the end i.e. 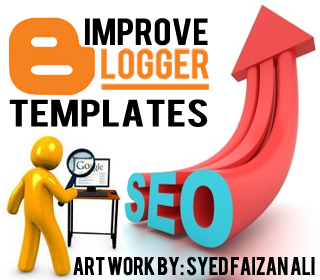 “This Article is Written By Syed Faizan - My Blogger Lab”. Search For <title><data:blog.pageTitle/></title> (usually at the top of your template). When you find it just replace it with the following coding. That't it save your template and now your Post titles will show your SITE_NAME at the end of each and every post. By apply these three techniques you will surly notice a significant increase in your website Traffic, but if you are already getting heaps of traffic then you don’t need to do anything just work on building quality Content. If you need any help feel free to ask till then, peace, blessing and happy SEO optimizing. Great points there. In addition, "search description" should be enabled so you can always add "description" to individual posts. Well, is it still a matter if my home page is set to noindex? I've been using that methode for several months and so far everything is okey. First We Though to Write a Little About Search Preference but this post was Dedicated to template SEO so we just exclude it. However, it is the perfect SEO Practice. Please make a logo for me as soon as possible. I give all credits to mbl for preparing mybloggernews logo. Hey, I have Told our Designers To Design a Logo For Your Blog it will take up to 2 to 3 Days for completion. Please maintain Patience. I always prefer to set Post titles of Individual Posts and pages to H1 tags. In home page we can easily change post title to H2 tag as well.. So that it will avoid too many H1 tags in Home page and we can easily give Importance to post titles by adding H1 tags in Individual pages. Have a Look to http://www.devmagpress.com/. I implemented it here to give a little SEO boost. I think we don need to add home page title along with post title in Post pages. It always lead to big and long titles which may lead to exceed 70 characters. Google itself is not recommending long titles in their SEO guide. I think you forget about custom perma-link feature. Using custom perma-link feature we can always create small perma-links by removing stop words from links. I still remeber a video matt explaining importance of small links. It Seems Like You are on WordPress. No Syed.. Devmagpress is a blogger blog. Most of WordPress themes are coming with these feature. An big blogs are also using similar kind of header tag optimization. That is why i suggested it here as comment for blogger blogs for better optimization. Hmm!!! greate post there o.
I think one is for the mobile template. How do I find that. Should I replace both of them with the H2 tag that you have given? Thanx alot for this nice and must know article! How do we put the keywords??? Seperated by 'comma'??? but my blog has bad seo. use H in template or in a post? There is no code in step 2. what we have to find in tempelate? Really informative.. and now i find the reason why the blog post appears first in Search!!! Kudos. Hi friend, i have made drop down menu bar for my blog. and it works fine on firefox and chrome but it doesnt work properly on Internet Explorer ? do u have any idea how do i solve this problem ? Now I am a regular visitor of your blog and It help's me very much. when i pulished new post it apear in search engine after 10 days now i have 17 post and blog is about 1 and half month old..
First i was better and get the result in search engine after 3 to 4 days but now its take upto 10 days..
What does this mean and how do you do it? Don't forgot to Check/Tick Expand The Widget Box. I did it thanks. I only get 13% traffic from the search engines so this will help. My blog went from 12.9% to 14.6% in a week and it is still climbing. You recommend people to use H2 tag for post title, while yourself using H1 tag. Isn't that confusing? Or you don't really trust your own tips? And This article sets all post title to h2 on archive page and homepage. However, a better approch is to only show h1 tags on Post when it is opened. While on arhive pages its h2. Please use our templates from http://www.templateism.com if you want h1 tags on posts pages and h2 on arhieve.